Who’s closing in on the men’s semis? FROM WIMBLEDON — In first glance, it looked like Milos Raonic is the favorite versus John Isner. But uh, uh. The American has beaten the Canadian three times, in Canada, in Cincinnati and Miami — all on hardcourt. In 2016, Raonic finally beat him, 7-6(5), 7-6(5) again at Cincy. Both of them have huge serves, both of them can smoke their forehands, both of them have improved there backhands — slightly. When they come in, and if you have to bend low, then that is trouble because they are very tall and it is hard to put it away. It was warm and sunny in the past nine days, but on Tuesday, it was cooler. However, it hasn’t rained. Because of that, the balls comes up higher. 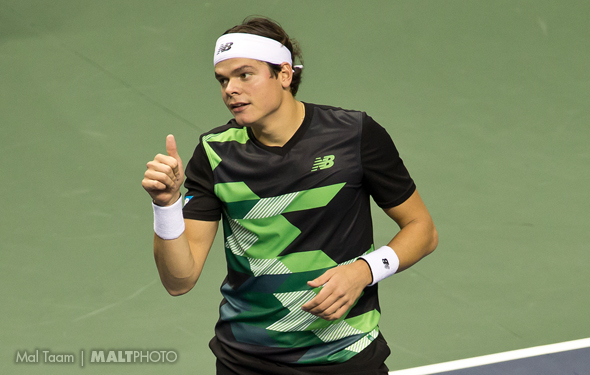 Raonic seems to like it, on court, that is. Raonic certainly loves grass, but he just can’t shake Isner. The American will bomb his big serves and his forehand. Isner will win on five sets. Rafa Nadal will face Juan Martin Del Potro, which is a very tight match. The Argentine will attack him anytime he can, and he will certainly risk his serves. He can’t allow Nadal to yank him around. Del Potro will push him early, and try to bother him, but Nadal will pound him on his backhand and throw in some sweet passing shots. Nadal will win in four sets. Roger Federer is the favorite everyday, so while Kevin Anderson is so mentally sound now, the South African has never beat the Swiss. Over the past year, he has improved a lot, but still, Federer is quicker, faster and conscious. ‘The Fed’ will win in four sets. Novak Djokovic is churning. Day after day, he is more comfortable, and the 12-time Grand Slam champion is oozing. He has to face Kei Nishikori, who is right in there, but two days ago, he said that his elbow was hurting him, but he got through Now Nishikori has to find away to unearth him. The Japanese says: “This is a fresh start.’ Is it really? We will find out. And so is Nishikori, in a smaller degree. For a few hours, Nishikori will handle him, rallying side to side. But in the fourth set, Djokovic will start to dominating his backhand and his serves. The Serbian will win in four sets, and after that, here comes playing Nadal — 52 times. That is a lot.